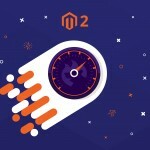 The Product Page PDF plugin for Magento 2 allows your customers to download and print a PDF document of your website product pages. 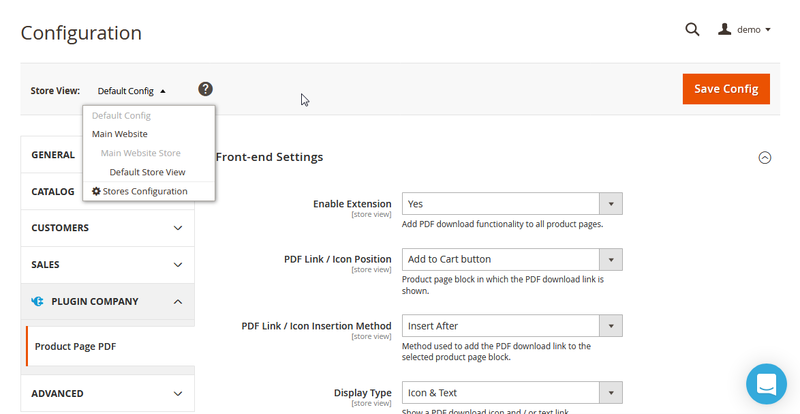 The extension places a PDF download text link or icon in a product page block of your choice so that customers can quickly access a PDF version of your product pages. 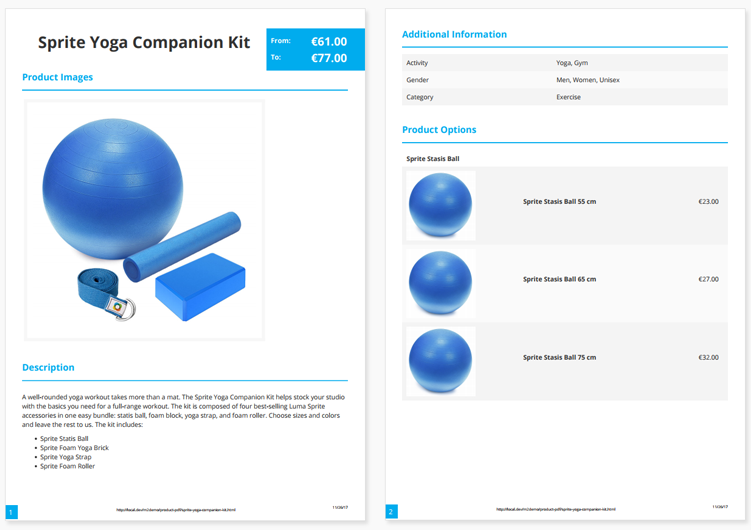 The extension brings merchants lots of configuration and customization options, enabling them to change the layout, design, and content of a product page PDF in the Magento Admin easily depending on their requirements. 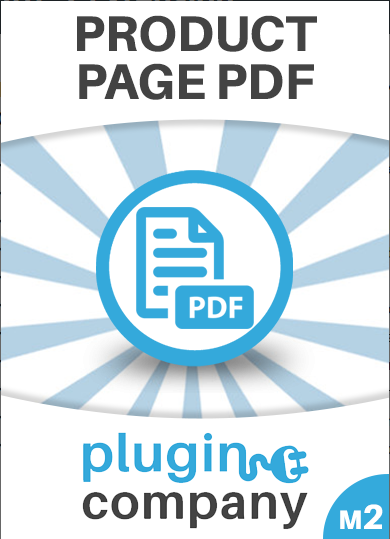 The Product Page PDF plugin is compatible with all types of products, including configurable, bundled, and grouped products. You can optionally add a PDF header with a store logo and a footer with a product page URL, timestamp, and page numbers to your PDF documents. 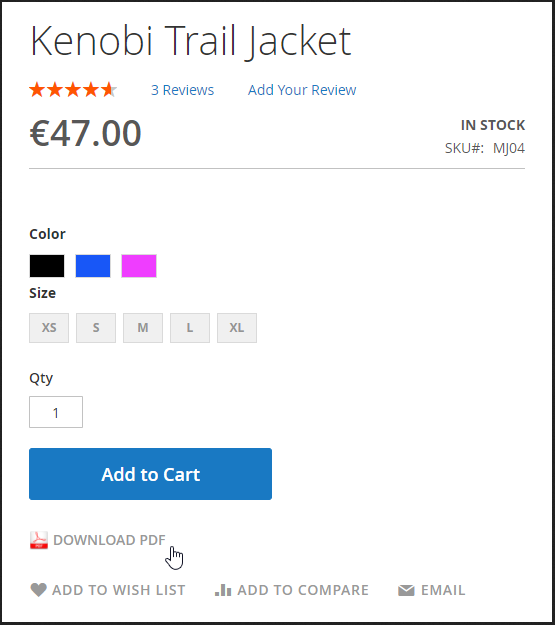 You can also decide to show product descriptions, image galleries, price information, and configure other custom settings from the admin panel. On top of that, merchants can use the Product Page PDF plugin for an unlimited number of products without any additional subscription fees. You can easily customize design and layout of your product page PDF using extensive configuration settings in the Magento Admin. You can choose which sections to include in the main content area of your PDF document, and add a PDF header or footer. 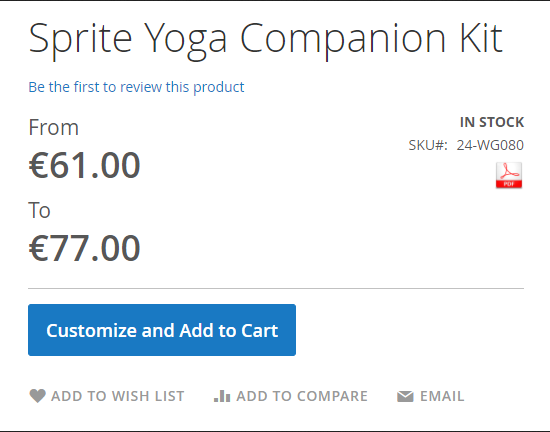 The extension also comes with other optional settings, like showing or hiding product price, including image galleries, or product descriptions, and more. You can quickly change the sort order of the content sections with an easy-to-use drag-and-drop interface. You can also decide whether to show each content section on an existing page or a new page. 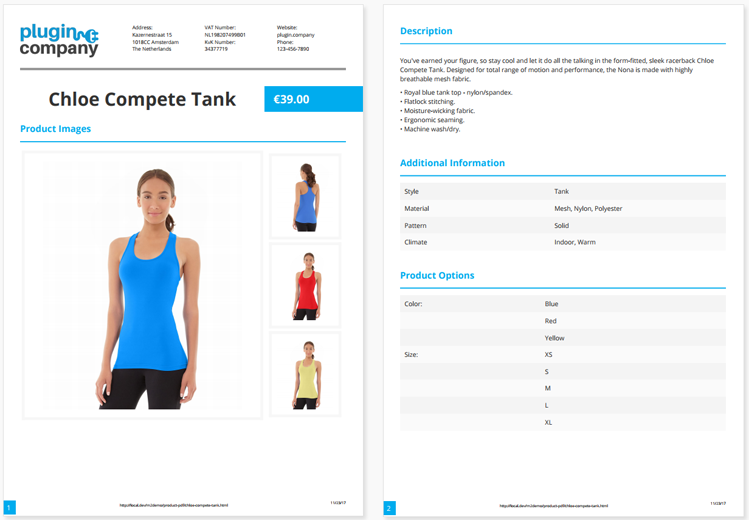 The Product Page PDF plugin offers users to choose an image gallery layout from seven different options, enabling them to find the most suitable style for their products showcase. Product images are evenly distributed through the PDF document pages, while duplicated images are filtered automatically by the plugin. With the extension, you can customize the font size and colors, font family, and background colors of most of the sections in your PDF document. The plugin offers 40 Google fonts to choose from and to use for your content elements, allowing you to create a product page PDF to match your brand and web store design perfectly. When a customer clicks on a PDF download text link or icon, a PDF document opens in a new browser tab. Besides that, a PDF download link or icon can be placed in different blocks of your website product page. To start configuring your product page PDF, go to Content → Product Page PDF → Configuration. In the Configuration interface, you can manage all the extension settings, like frontend settings, font settings, PDF header and footer settings, the sort order of page sections, image gallery settings, and additional information settings. You will reach the same Configuration screen if you navigate to Stores → Settings → Configuration and select Plugin Company → Product Page PDF in the menu on the left. If you run multiple stores on your website, you can configure Store View settings from the drop-down menu in the top left corner. In the Frontend Settings, you can choose to show a PDF icon or text link on your website product pages, and configure its position and style. To add PDF download option to your website pages, select Yes in the “Enable Extension” setting. 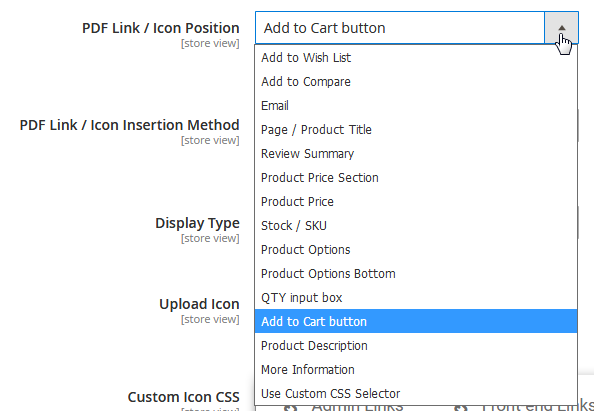 In the “PDF Link / Icon Position”, you can select a product page block where PDF link or icon will be displayed. Here you can also choose to use custom CSS selector. PDF download link or icon insertion method defines how a PDF link or icon will be inserted in the chosen product page block. As a display type, you can choose to show PDF icon or text link, or both icon and text link. If you want to add a PDF icon different from the default PDF icon to your pages, the extension allows uploading a custom icon image. Custom CSS attributes for the PDF icon are specified in the “Custom Icon CSS” field. In the “Link Title”, you can create any title for your download link or title. If nothing is entered in this field, the extension will use “Download PDF” as a default title. Custom CSS attributes for the download link are specified in the “Custom Link CSS” field. In this settings section, you can also specify custom CSS classes to change the look of your PDF text link or icon. In this section, you can pick a default font size and color to use for the product descriptions in the PDF content. 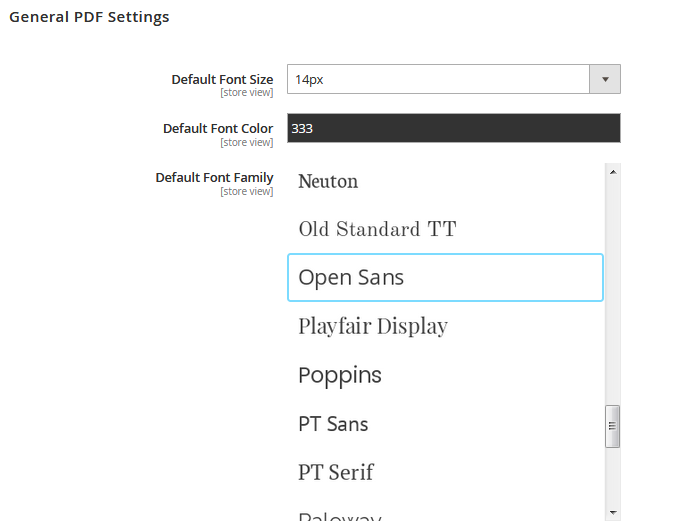 In the “Default Font Family” settings you can choose a default font family that will be applied to all PDF content, or select a custom font for various PDF elements that we will consider below, choosing from 40 different Google fonts. In the extension configuration, there is an optional setting to include a header to the PDF document. 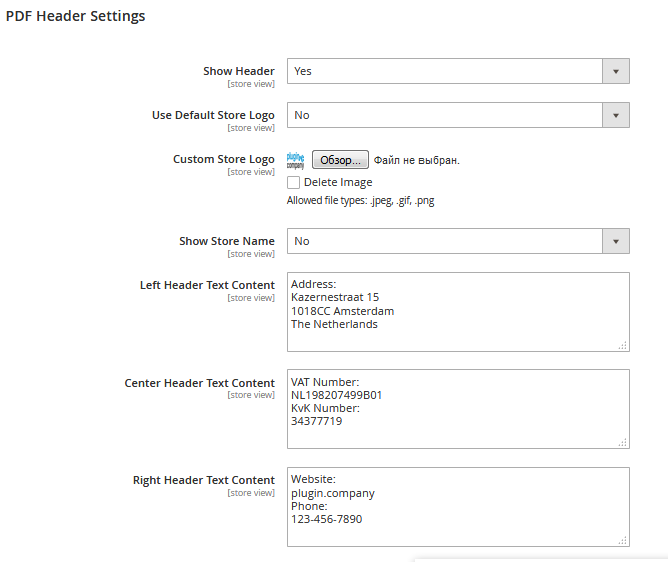 You can add a default or custom store logo, a store name, and up to three columns with text content to the PDF header. 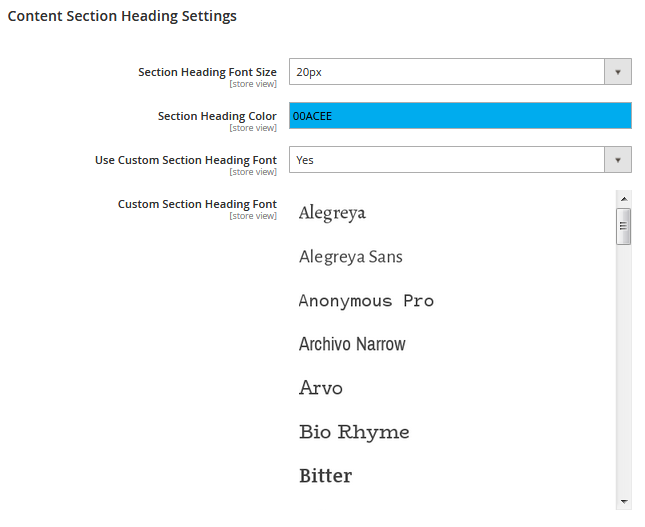 In this configuration section, you can also customize font size and color of the header text, choose to show a header separator, and change thickness and color of a header separator line. Now we will show how to configure main content area of a product page PDF. In this section you can customize the headings of the PDF content sections, changing their font family, font size, and font color. The extension allows users to sort and rearrange the product page PDF sections using a simple drag-and-drop system. 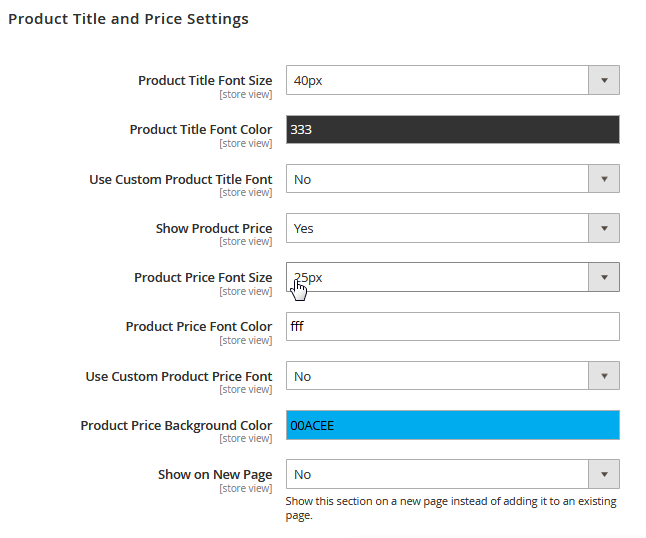 In this section, you can choose the font size, color, and font family for the product title. 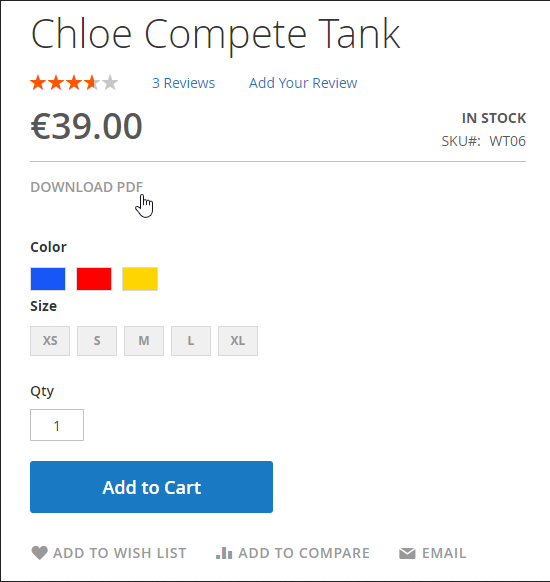 Here you can also enable to show product price in the PDF document, change the font family, color, and size of the product price, as well as its background color. 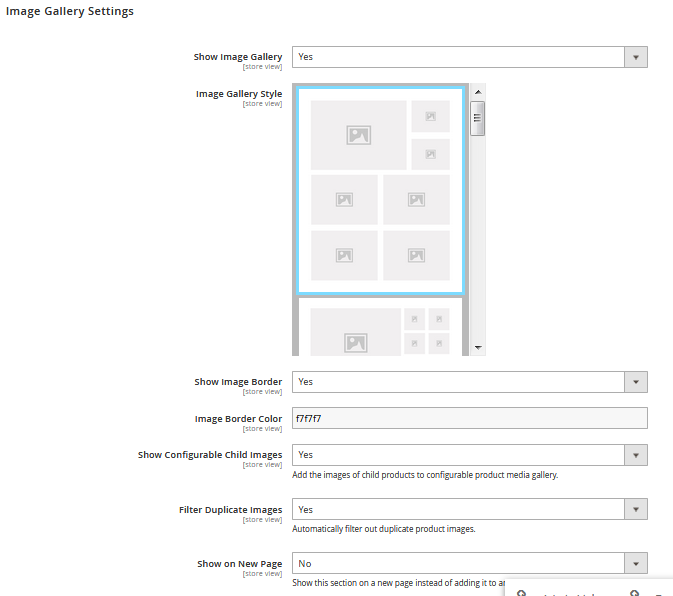 This configuration section allows you to enable image gallery in the PDF and choose from seven image gallery styles with automatic duplicate image filter. You can also use and customize a border around the images, as well as add images of child products to configurable product image galleries. 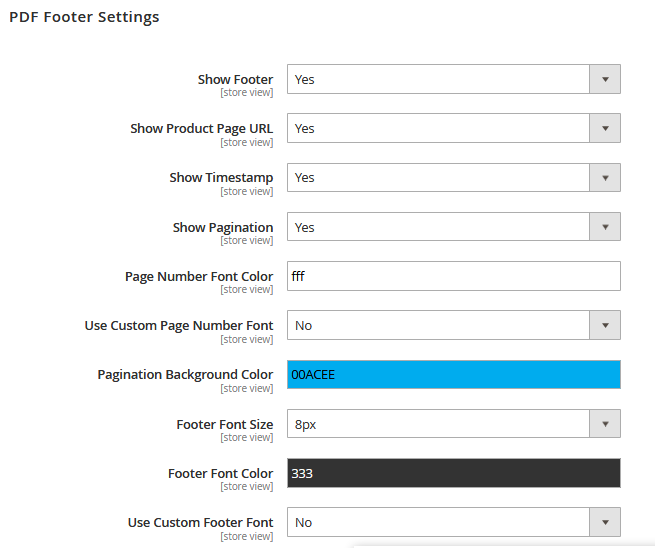 In the PDF Footer section, you can optionally choose to add a PDF footer to a product page. 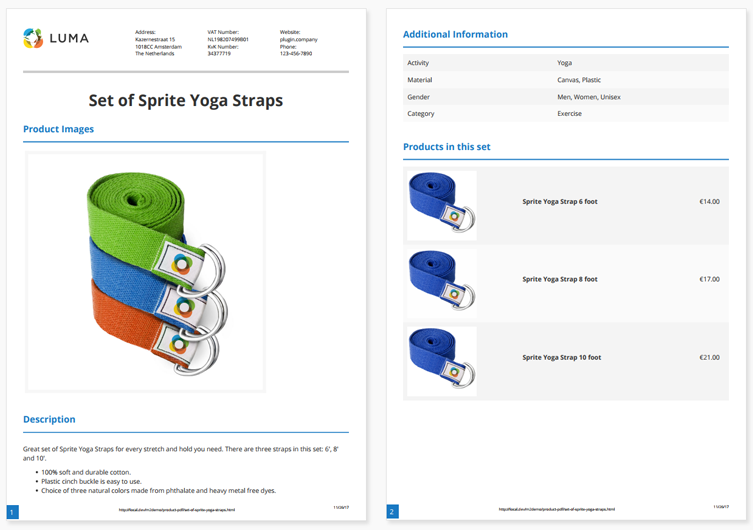 You can include page numbers, product page URL, and a timestamp in the PDF footer. Here you can also change fonts, font size, and colors, and background color of page numbers and other elements in the footer. 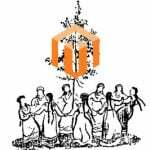 Choosing from a wide variety of configuration settings in the backend of the Magento Admin, you can provide your customers with different options for downloading product page PDF documents on your website. 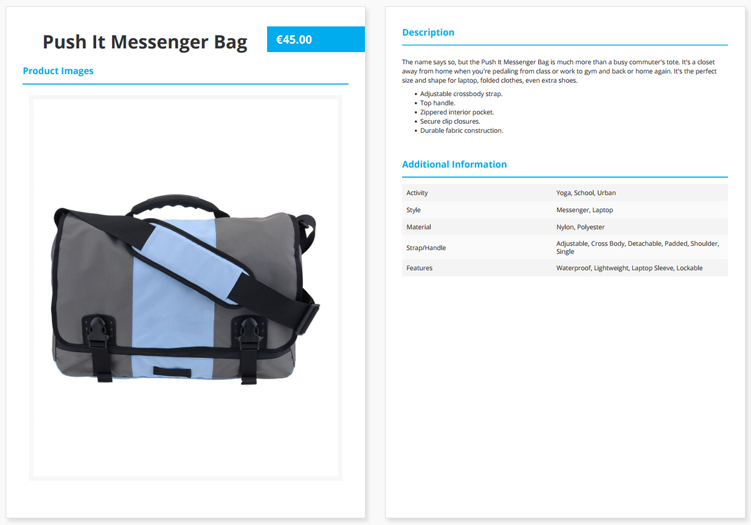 Next, we will have a look at a few product page PDF examples with different frontend display settings. These examples show just a few design and display options for a PDF layout and content that you can create using the extension. 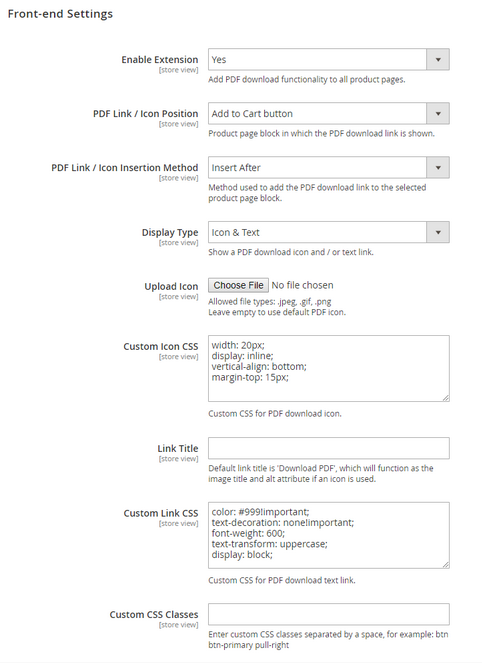 The Product Page PDF plugin also lets you choose the position of a PDF download link or icon. You can purchase the Product Page PDF extension for Magento 2 for the price of just $69. 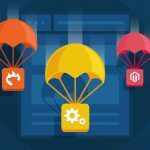 With the purchase, you also get an extension package that includes full customer support, extensive user guides and manuals, and absolutely free plugin updates and bug fixes during the first year. The extension comes with a high-quality code that is a fully open source. Moreover, Plugin Company ensures a money-back guarantee for 30 days.